A key objective of this blog is to document the slow, often challenging process of transforming myself into an elite triathlete. Too often, we only hear about an athlete’s successes, while their struggles, insecurities and screw-ups don’t get the same billing. It’s all part of the learning process and I haven’t shied away from sharing my highs as well as my lows. In being so open, I hope to demystify elite development and help athletes of all levels learn from my experiences. One question I’m often asked is how I climbed my way to the pro level in triathlon (whatever that means). The best advice I can give is that it’s about embracing the never-ending process of seeking out and destroying your limiters, even if that entails radical change. Last year, I wrote a series of posts describing how I’ve been systematically tackling performance-limiting factors related to training, recovery, nutrition, sleep, stress and psychology. I was grateful to receive such a positive response. The recovery plan outlined in that series was prompted by a low point in my athletic and personal life resulting from cumulative stresses over the past few years. At the time, I self-diagnosed with “overtraining syndrome”. While that term is often thrown around by endurance athletes and even worn as a badge of honour, it is a nebulous and probably quite rare diagnosis whose definition and very existence is the subject of debate . Overtraining syndrome is catchall term for a broad range of related symptoms that are probably better described more specifically. Recently, some expert help, blood tests and a good deal of research have greatly improved my understanding of my health issues. I wanted to update and condense this information into a case study to show how past mistakes hurt my health and nearly dashed my hopes of competing as a professional triathlete. The damage I did to my hormonal profile while continuing to compete at a high level may surprise you. This is more than just a cautionary tale. Although I screwed up royally, I’m bouncing back much stronger and smarter. Major changes and a fundamental shift in my thinking over the past year are making me a faster triathlete, but more importantly, a happier and healthier person. Testosterone levels are influenced by training, sleep, stress, nutrition and many other factors, and may therefore be considered a barometer for overall health. Testosterone, in turn, plays a crucial role in many aspects of athletic performance and quality of life, from energy levels, to rate of recovery, to body composition, to mood, to libido. Below are the results of three blood tests for free testosterone over the past two years. The dashed line shows the lower limit of the lab’s reference range, i.e. the minimum level considered acceptable (not optimal) for healthy adult men. The solid line shows average free testosterone for 25-34 year old men (I am 24) when testosterone is near its peak. Some other blood markers have been less than ideal, but low T was the major red flag. 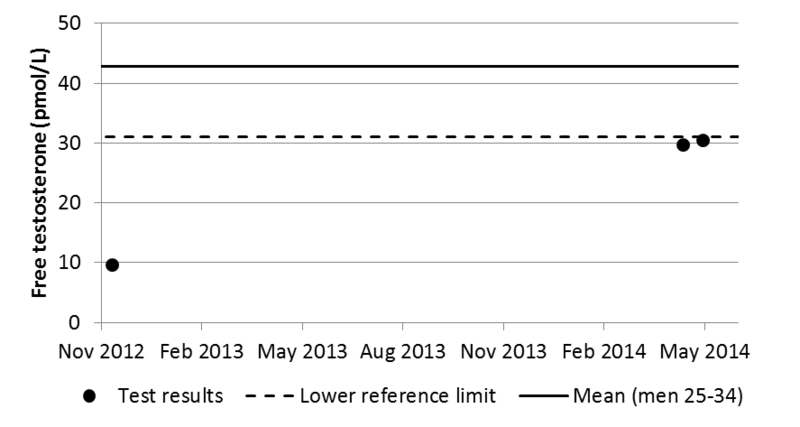 Morning blood test results for free testosterone, 2012-2014. My levels were below the lab’s reference range and well below the mean for 25-34 year old men (42.8±9.8 pmol/L, 12.3±2.8 ng/dL). Seeing that first result in December 2012 was disturbing, but not altogether unexpected. At some level, I had known that something was amiss. But coming off a breakthrough triathlon season, it wasn’t hard to suppress my concerns and ignore even the most obvious warning signs. Seeing the cold, hard numbers—irrefutable evidence of a problem—really cut through the denial and motivated me to make changes. Another thing that I attribute in part to low T is my exceptionally poor sprinting in swimming, cycling and running (which is also a product of my muscle fiber type distribution and training). My threshold power/pace is relatively high, but there was a time when your average preteen girl could out-sprint me! This wouldn’t be relevant for triathlon if it weren’t for the tactical importance of a fast swim start. A more subtle psychological repercussion of low T may be reduced aggression . Although I am a highly motivated athlete, I often felt like my “killer instinct” came up short when it mattered most in races. As an example of my foolishness, my training log shows a 50 day streak of double workouts in 2012 at a time when I was drowning in my final overloaded semester of university and waking in the wee hours every day. That was how I operated for the better part of four years. One huge frustration is that I suspected low T way back in 2010 and asked the doctor at the student health clinic for a test. “Oh no”, she assured me, “that’s very unlikely”. It then went undiagnosed for two more years! Despite making some changes in 2013, I basically hid my head in the sand and did not retest T until the spring of 2014. In my defense, I had become so accustomed to operating below my potential that my idea of normal was skewed. Was it normal to depend on a nap every day? Was it normal to feel foggy and wrecked most of the time? Was it normal to feel like 50 IQ points were missing? Was this just the price of training at a high level? Making the jump to pro racing in 2014 spurred me to even greater overreaching in my training. I was a wreck throughout the build to my first pro race, Texas 70.3, in April. I repeatedly suffered bouts of fatigue that would physically and mentally derail me for several days per month. No fewer than three coaches, a sports doctor and my parents eventually helped be realize, by degrees, that this wasn’t normal. In retrospect, I’m shocked that I pulled off a good performance at Texas 70.3, although I paid a high price. It took a full month to recover from that race, which prompted me to retest my T and finally get serious about this issue. It took years to suppress my testosterone and my recovery has similarly proven to be a long process. 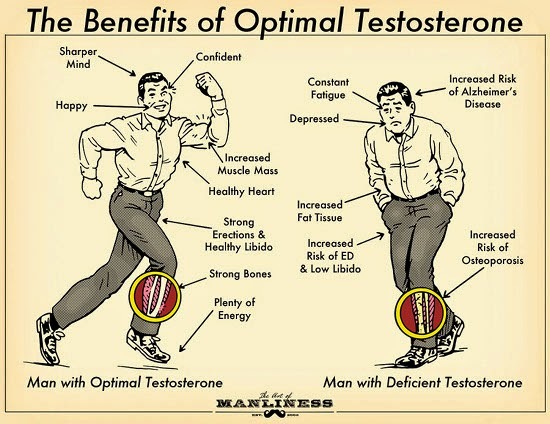 In the second part of this article, I will describe the holistic, science-based approach I’ve taken to boost my testosterone back up to healthy levels.